That was back in 1983. I saved the plane, limping it up into the pattern and back around for a landing. The only injury a pulled muscle in my chest from fighting the heavy controls. And during those frantic, terrifying minutes I completely forgot I was in a flight simulator. Yep. I was sitting on the ground the whole time, enclosed in an old ATC 810, in a classroom at Aims Community College. In those days, flight simulators weren’t much compared to what we have today — no movement, no simulated view outside the frosted windows — but the box-like 810, as well as a squadron of desktop simulators arranged on long tables in front of folding chairs, helped my classmates and me become aviators more safely, and more cheaply, than if we’d been learning all of our lessons in real airplanes. And that’s exactly what Ed Link was thinking in 1927 when he invented the world’s first practical flight simulator. In his early 20s, Link got bitten by the aviation bug but faced a problem as old as aviation, one that continues to this day: His aspirations were greater than his wallet. Recognizing his problem wasn’t unique, he saw a business opportunity. Working part-time in the basement of his father’s piano and organ factory he began to build what he called a Pilot Trainer. The result was something that resembled a stubby-winged toy airplane on a moving stand. Powered by an electric pump and organ bellows, the truncated airplane would pitch up and down and bank from side to side in response to control inputs, mimicking the movement of a real airplane. Link’s invention was far from being a success. He sold more Pilot Trainers to amusement parks as coin-operated carnival rides than he did to flight schools as aviation training devices. But the next generation of Ed Link’s Pilot Trainer would change the world. In 1933 Link added a hood and an instrument panel to his trainer, transforming it from a device that taught basic movements to a machine for safe, affordable instrument flight training — and a new industry was born. Link’s first big sale, for six trainers, was to the U.S. Army Air Corps in 1934. The Corps had taken over the air mail in the wake of a contract-award scandal — called the Air Mail fiasco in the press of the day — but the Corps was ill-equipped to do so. The Army Air Corps was a daylight, fair weather outfit at the time. In 78 days of carrying the mail, the Corps suffered 66 major accidents, and lost 13 crewmembers. The brass knew they had to get up to speed with instrument flight and the Link trainer was the just the ticket. In the years that followed, Link’s simulator business grew, but the Link Trainer wouldn’t come fully into its own until it went to war. Called the “blue box” by servicemen in World War II, the iconic ANT-18 Link Trainer was used to develop the instrument flying skills of over half a million allied servicemen. Ironically, it also helped train many of the Japanese pilots who attacked Pearl Harbor: Ed Link’s second customer, back in 1935, was the Japanese Imperial Navy. The World War II version of the trainer was no carnival ride; it was a full-fledged flight simulator. Driven by multiple sets of air-driven bellows assemblies, the simulator rotated on all three axes, and could simulate pre-stall buffeting, spins, and even landing gear over speeds. A separate instructor’s desk served to control the simulator and recorded the student’s success over an aviation chart. Link sold more than 10,000 simulators during World War II. Following the war, Link’s company continued to make simulators for the military, including devices for high-performance aircraft, and they even built the lunar lander simulator for the Apollo missions to the moon. Link is still in the simulator biz today as a division of L3 Technologies, making a portable helicopter simulator for the army that fits into two 53-foot tractor-trailers. But its products never gained traction with the general aviation market. That void would be filled by a whole different kind of flight simulator. In the 1970s and 80s, ATC Flight Simulator Company filled community colleges and flight schools with the iconic table top ATC-610 and 710 general aviation simulators to teach instrument flight skills to new pilots, and to help existing pilots stay proficient on their instrument skills. These flight simulators looked like instrument panels that had been surgically removed from well-equipped general aviation trainers and wrapped in plastic cases. While they looked airplane-like — featuring the classic six pack, navigation instruments, radios and transponders with adjustable knobs, engine monitoring instruments, throttle-mixture-prop controls, and even working mag switches — and were more precise than any simulator that came before, they certainly didn’t feel airplane-like. I can still remember sitting in a folding chair “flying” one. The optional rudder pedals on the floor kept sliding away from my feet. The humming and flickering florescent lights above reminded me that I was very much NOT in an airplane. And, of course, it didn’t move. Simulators had lost the link. Still, the table top simulator taught me, and thousands of other trainee pilots, the basics of instrument flight safely and economically — which has always been the purpose of a flight simulator since that first one was cobbled together in the basement of the Link Piano and Organ Company. Like the Link company, ATC is still in business today. They sell newer versions of their classic products, now with sophisticated digital imagery for a simulated view of the outside environments — as well as retrofits for their old products — but their simulators are still motionless. 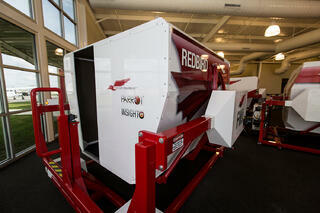 In 2006 a new company called Redbird burst onto the scene with a full motion enclosed simulator for far less than the price of a typical GA training aircraft. The Link was back, and better than ever. In some ways, the modern Redbird fulfills Ed Link’s original vision. Like the simulators of the last seven decades, it is an instrument training platform. But it is so much more. With a worldwide terrain database and 200-degree visuals, student pilots can practice turns-about-a-point over a highway intersection just as easily as they can practice a GPS approach. But most importantly, Redbirds move like real airplanes. Students feel a simulated atmosphere alive with bumps and jolts in a plane-like machine that moves like the real thing: Redbirds boast 50-degrees of pitch, 60-degrees of yaw, and 40-degrees of roll. Even without a war, Redbird took the world by storm. With 1,200 of their simulators in place globally, they strengthen and improve aviation skills. The company produces many FAA approved aviation training devices (ATDs) with an available motion system, ranging from the compact MX2 to the cockpit-specific AMS. They also make a full motion helicopter simulator and a specially engineered crosswind trainer that slides back and forth on rails, and banks left and right to help pilots master the tricky stick and rudder skills needed for crosswind landings in strong winds where initial training would be dangerous. The Xwind, as it’s called, simulates crosswinds up to 30 knots. And turbulence. And wind shear. Over the course of seven decades, the flight simulator has come full circle. First it moved. Then it was frozen but made more realistic in other ways. Then it was thawed out again, free to move and now more realistic than ever. It has evolved from bellows to high-end electronics. From a windowless box to a view that rivals the real thing. At each step in this evolution simulators have helped aviators improve their skills economically and in complete safety. Well … I guess I should say in near complete safety. After all, I did manage to hurt myself in a simulator once-upon-a-time. But at least I didn’t crash the simulated plane that day, nor have I crashed a real plane in the three decades since. That’s in part, I think, thanks to my simulator training. Training which let me hone my skills on the edge of disaster — something we simply can’t do in real airplanes. At least not without risking much more than a pulled muscle.